Estuaries are places where freshwater rivers and streams flow into the ocean, mixing with the seawater. They are a sort of nursery for fish and a good habitat for shellfish and marine invertebrates and they are also important for mammals such as seals and otters. 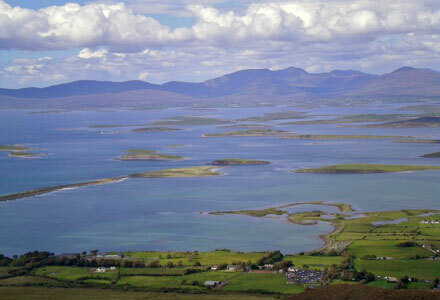 Mayo's coastline is very rich in small and large bays, the best-known is Clew Bay where very small bays and islands make up an interesting variety of marine and terrestrial habitats. Killala Bay and the Moy Estuary have an international importance for nature conservation, in particular for birds, rare molluscs (Vertigo species) and plants (hoary whitlowgrass). Blacksod Bay is unique in Ireland because all four species of mammals live here: common and grey seals, bottle nosed dolphin and harbour porpoise. The bays house a large number of sea birds such as dunlin, ringed plover, geese and tern species.